Review: An advice columnist, Andie Anderson (Kate Hudson), tries pushing the boundaries of what she can write about in her new piece about how to get a man to leave you in 10 days. Her editor, Lana (Bebe Neuwirth), loves it, and Andie goes off to find a man she can use for the experiment. Enter executive Ben Berry (Matthew McConaughey), who is so confident in his romantic prowess that he thinks he can make any woman fall in love with him in 10 days. When Andie and Ben meet, their plans backfire. How to Lose a Guy in 10 Days is your typical average rom-com. The premise is incredibly flawed in this one, with Kate Hudson and Matthew McConaughey's silly experiments inexplicably getting intertwined in a way that ONLY happens in movies. I will give Hudson and McConaughey credit, as they do exhibit good on-screen chemistry, and provide for several light-hearted laughs throughout. There is nothing truly great about this movie, but it accomplishes what's intended. This film is a light, mindless comedy that provides some entertainment value through two solid actors that are decently funny while getting wrapped up in a predictable love story. While this movie may not be the best in terms of rom-com classics, it's certainly not the worst. 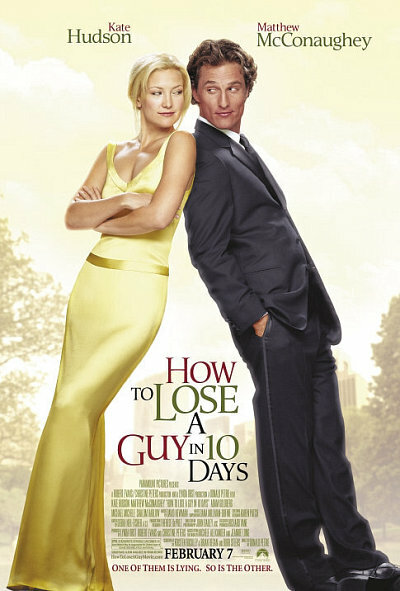 How to Lose a Guy in 10 Days will never be considered as a film that transcends its genre, but it's a movie that stands the test of time as a feel-good flick that you won't regret watching every now and then. Just don't expect it to have you rolling on the floor, laughing with emotionally happy tears in your eyes. Fun Fact: Kate Hudson improvised plastering Matthew McConaughey with kisses during the scene where she introduces the new dog. This is why McConaughey looks genuinely surprised.